Three times this evening, I have posted, waited a long time for the screen to change and then gotten the screen below. When I go back, the post actually did work. I know from experience when that happens, if I hit the back button and hit post again, it will duplicate post, so I don't do that. I noticed someone did do a repeat post this evening, so I may not be the only one. Windows 7 Pro 64-bit, latest version of Chrome, premium speed home connection through Verizon, everything else, including other sites, working OK.
LimaCharlie, Big Western and CG11 like this. I had the same issue a few minutes ago. Me too. DB errors, etc. Same thing this morning when posting. I had the same message appear on a recent post, even though the post did go through. I'm not getting that message, but when I hit "Submit" the progress bar hangs. If I hit submit again, I get the message that the post is identical to the one I just "posted". The post was made but the database front end that I am seeing does not show that as happening. 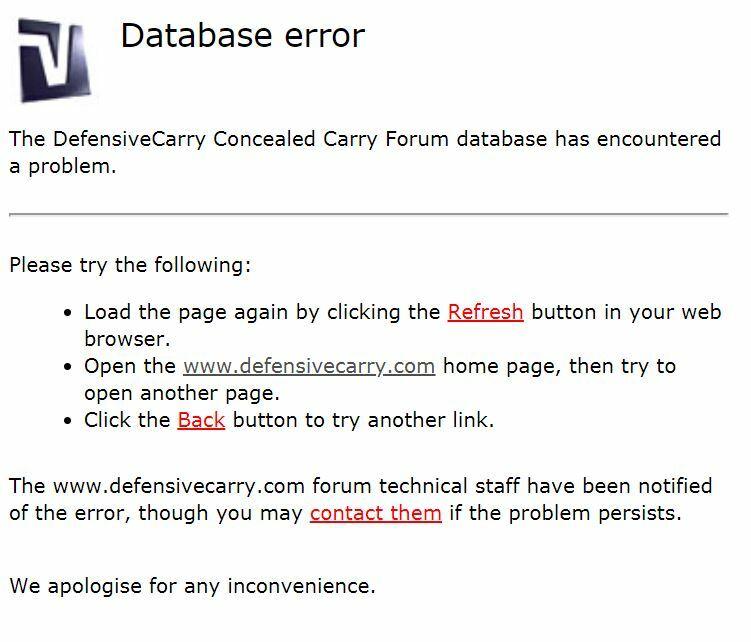 The forum is running incredibly slow this morning as well, and I am getting the same action as G26Raven describes - very frustrating. There is still a very long wait for the post and then I get the "data base error" this morning. I hit the page back arrow and hit the "Active Topics" button and then my post shows up. Give me a bit to check into this. Testing for a bit, please ignore me as I may test multiple times. Testing from the advanced mode. Who has been bullying the hamster? This has been escalated. A tech is looking now.